Terrace Gardens08456 122 660work GardenTerrace Gardens, located close to Richmond town centre, was originally formed from three separate eighteenth century estates and was opened as a public park in 1887. Between 2007 and 2009 The London Borough of Richmond upon Thames invested £1m in the refurbishment of the Gardens. The project included major upgrading of the infrastructure of the Gardens, new signage to reflect the historical, ecological and educational aspects of the Gardens, and repairs to furniture, features and artefacts. In addition, large areas of the Gardens were re-planted with a mixture of sustainable planting designed to look attractive but also be valuable to wildlife, as well as more traditional planting such as the Rose Garden and Herbaceous Border. Wildlife features such as Stag Beetle Loggeries, Dead Hedges and a Leaf Litter Sculpture were installed in the Woodland Garden and we also opened up spectacular views to the River Thames from within the Gardens which had become obscured over the years by vegetation. The Gardens provide wonderful opportunities for walking among the mature trees, enjoying the formal and informal planting, having a picnic, being with nature, as well as sitting or reading and enjoying the views of the River Thames. There is also a café in the gardens which is open 7 days a week during daylight hours. Terrace Gardens, located close to Richmond town centre, was originally formed from three separate eighteenth century estates and was opened as a public park in 1887. 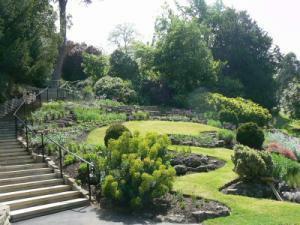 Between 2007 and 2009 The London Borough of Richmond upon Thames invested £1m in the refurbishment of the Gardens. The project included major upgrading of the infrastructure of the Gardens, new signage to reflect the historical, ecological and educational aspects of the Gardens, and repairs to furniture, features and artefacts. In addition, large areas of the Gardens were re-planted with a mixture of sustainable planting designed to look attractive but also be valuable to wildlife, as well as more traditional planting such as the Rose Garden and Herbaceous Border. Wildlife features such as Stag Beetle Loggeries, Dead Hedges and a Leaf Litter Sculpture were installed in the Woodland Garden and we also opened up spectacular views to the River Thames from within the Gardens which had become obscured over the years by vegetation. The main entrance to the Gardens can be accessed from Richmond Riverside by crossing Petersham Road. You can also enter the Gardens from the gravel walk at the summit of Richmond Hill.